ANKARA ÜNİVERSİTESİ DTCF ÇAĞDAŞ TÜRK LEHÇELERİ VE EDEBİYATLARI BÖLÜMÜ VE TÜRKSOY İŞBİRLİĞİYLE CENGİZ AYTMATOV GÜNLERİ'NİN İKİNCİSİ DÜZENLENDİ. BİR ÇALIŞMADIR. ALFABETİK SIRA İZLENMİŞTİR. the Russian critic, the literary critic. The professor of the Moscow State University. literature of 20 century, V.V.Nabokova's creativity. KARDEŞ KALEMLER DERGİSİ SAYI 19,S.89. 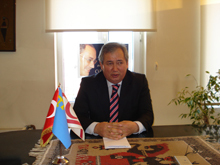 *CENGİZ AYTMATOV ÖYKÜLERİNDE ÖTEKİLEŞME SORUNU VE TAHRİP EDİLEN BELLEK MEKANLARI,PROF.DR.RAMAZAN KORKMAZ,MAVİ ADA,SAYI:2008. * "AYTMATOV ANLATILARINDA ÖTEKİLEŞME SORUNU VE DÖNÜŞ İZLEKLERİ-PROF.DR. RAMAZAN KORKMAZ" HAKKINDA- ARAŞT. GÖR. VEYSEL ŞAHİN-FIRAT UNI.-TURKISH STUDIES,VOLUME 4/3 SPRING 2009.